This is a picture of a mold project from summer 2018. 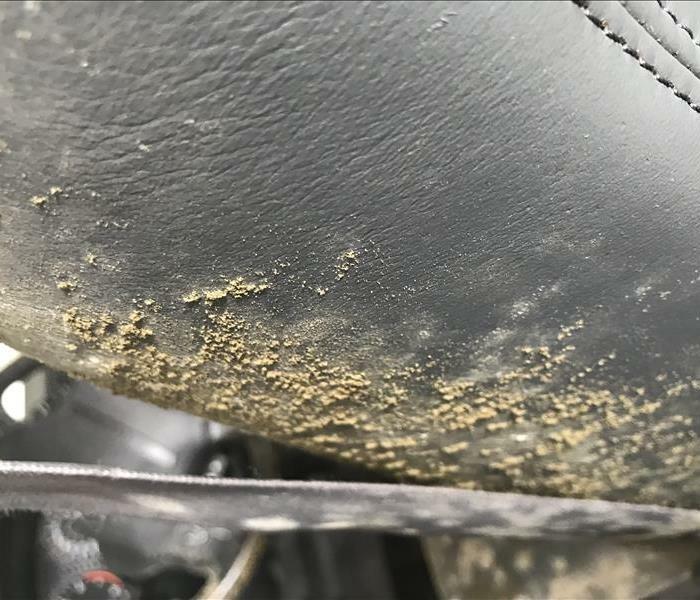 Inside a car, mold grew at a fast pace covering the entire inside of the vehicle. I recently attended a Mold CE class; continued education is important to our industry. As technology advances and we find new ways of researching, cleaning, and improving our methods, it is important to stay up to date on all of this. Not only is it beneficial to prevent liability, but who would you rather give work to, someone who has an idea of how mold should be handled 5 years ago compared to how it should be handled today? We believe in prevention, taking the steps to prevent a little problem before it turns into a BIG problem. In this class, it covered a story that hit 48 hours back in 2000. You may even recall the story, Allison Ballard and her husband purchased their dream home in Texas. A 22 room mansion on 375 acres. You would think they had it all, until they discovered leak behind their refrigerator. They had a plumber come out to fix the problem but didn’t file an insurance claim. Three weeks later they noticed the hardwood floors became warped and buckled. They filed a claim with their insurance, the insurance settlement was delayed for a month. At this time toxic mold had developed and spread rapidly throughout the house. The water claim turned into a mold contamination throughout the entire house. Causing the family to experience several health problems: loss of memory, running noses, dizziness, asthma and coughing up blood. When they visited their doctor, their symptoms were compared to a “really bad flu.” Yikes! Eventually the house was bulldozed and rebuilt, since the story was covered on 48 hours it caused national awareness. The toxic mold that grew within the Ballard house was Stachybotrys, a black mold and highly toxic. Since 2000, steps to clean and treat mold have changed. In this documentary the family left their home the way it was and fled the scene for their lives. Leaving all personal belongings behind for fear of bringing contaminated items with them. Today, this would not have been the case. If you discover more that 10 square feet of mold call your local Mold Hygienist, here in Gig Harbor/North Tacoma we can give you a name and number of who we refer this service to. Call us at 253-851-6711. Be sure to review your insurance policy- depending on your policy the hygienist will either bill you the customer, or your insurance company, or us SERVPRO. All of this varies on the situation. We have seen the price start anywhere from $750 and go up from there, depending on how many ‘tests’ need to be taken. The ‘Game plan’ will be forwarded to either you the customer, your insurance agent (if it’s covered) or us SERVPRO. The next step is for us to come in and remediate the mold by the hygienist suggested manner of removal. Ok, let’s talk about that $750, that’s a lot of money if you are A. not covered, or B. covered. Think of it this way, you are preventing this “little problem” from turning into a larger problem. Trust us, you don’t want long term health problems, or to leave your home. The Ballard family left all their possessions. We can come in, clean, remove and seal effected areas and make your mold damage “Like it never even happened.” It can be a scary and tricky thing to deal with, but we are trained professionals with the very best intentions of helping you in this type of situation. Call us today, we are here to help. The benefits of being a franchise owner in the SERVPRO franchise world is receiving continued education. Our brand strives to be the number one choice of residents and commercial business owners nationwide. Having a number one performing company in the restoration industry means keeping their owners and their employees up to date on their resources. Our corporate office is based out of Gallatin Tennessee, meaning our trainers are constantly on the road, in the air, getting to a franchise location and providing education, mentorship, and support to each franchise owner and their employees. Why is that important? How does that have anything to do with you? You may be asking yourself. It means we are consistently educating ourselves in our market to achieve perfection in our brand and industry. It also means that across the board throughout the United States, someone who needs help on a water damage in New York will get the same response and care as someone in California. Our technicians are all trained professionals, there is no job too big, no disaster we can’t handle. Now, I’m going to be honest with you, not all franchise owners are the same person, personality, or same way of running a business. So, there can be situations where we differ in our execution, but overall, we all buy into the brand, we all buy into the SERVPRO system and we all want to see each other succeed in this business. We take each customer experience personally and really try to achieve a customer’s approval. If we do not get these results, it not only makes our brand look inconsistent, but it also reflects the business owner, our production crew and believe it or not our families. As a customer shopping for a dependable brand, consider our SERVPRO of Gig Harbor/North Tacoma, and Mason County business to be your number one provider. You will rest assured that we are nationally known, trained with the same standards expected from our corporate office, and family owned. We live here locally in Gig Harbor and service Gig Harbor, North Tacoma and Mason County territories. Why SERVPRO, why not? Let us take care of you and help make your disaster “Like it never even happened.” We are ready for any size damage, any time of the day or night. Call our office today 253-851-6711. SERVPRO of Gig Harbor/North Tacoma will make your commercial business water damage, fire cleanup or mold remediation "Like it never even happened." At SERVPRO of Gig Harbor/North Tacoma we are locally owned and operated which gives us the quickest response time when you have an emergency in your business. When your commercial property has been affected by water damage call SERVPRO of Gig Harbor/North Tacoma. When you work with SERVPRO you are working with IICRC trained (Institute of Inspection, Cleaning and Restoration Certification) & thoroughly background screened professionals. SERVPRO of Gig Harbor/North Tacoma is the fastest responder for the Gig Harbor, North Tacoma areas. We will immediately start by containing the area that was damaged, so no further damage occurs. From there if it is a water damage from a broken sprinkler line, toilet overflow, or broken pipe, we will start by extracting water and cleaning the area with the appropriate method preventing microbial growth. Water intrusion or smoke damage can spread quickly throughout any building, ruining carpets, upholstery, furniture, books, and other important items. When water damage occurs, exposed metal is susceptible to tarnish, and wooden furniture can swell and damage beyond repairable. Mold and bacteria’s can also grow in a rapid rate. 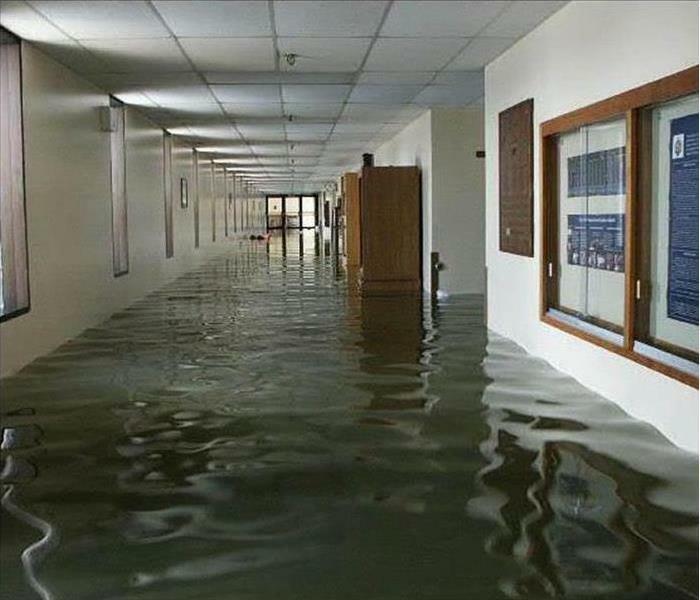 If water damage is is not addressed further damage can occur to doors, windows, and walls. It is extremely important to start the cleanup process as soon as the water damage is found. We have worked with many local businesses and have multiple testimonials that we would be happy to provide you upon request. It is our goal to give you all available information so you can make the best educated decision on how you would like to move forward with mitigating the damages and get your business back up and running. No matter what size of your commercial business, from a multi-building auto dealership to a smaller mom and pop run business we are prepared to take care of your business and get it back up and running. We understand here at SERVPRO that your business is your livelihood and your entire life’s work. We know that as long as your business is not fully functioning the financial impact increases daily. SERVPRO of Gig Harbor/North Tacoma is a family run business and we promise to treat your business like it was our and get you back up and running as soon as possible. You can reach a SERVPRO of Gig Harbor/North Tacoma representative 24 hours a day, 7 days a week, at 253-851-6711 and we will make it "Like it never even happened." Occasionally we get a request regarding smoke damage, this can include a multitude of categories, causes and effects. How so? Smoke from fires, stoves, candles, oil lamps, fire places, smoke from tobacco or cannabis, BBQ smoking, incense, and vehicle exhaust. First, lets look at the explanation of smoke. Smoke is a collection of airborne solid and liquid particulates also gases. We had a smoke damage once that was caused in a garage. The homeowner had been smoking some salmon in his garage, and some interested critters got in and tipped over the smoker. Causing quite a mess and fire too. Other smoke damages we frequent are landlords whose tenants have odor from tobacco or cannabis residue. It’s amazing the damage these can do within your home. One of our employees is a rental owner and used our services to remove tobacco stains from the walls. Nicotine can leave an orange-ish brown residue to your walls, and other surfaces. It can be an easy clean up on some surfaces and others it requires a little more grunt work. We’ve had a fire/smoke damage where the client had a basket weave to her head board and bedroom set. She also had respiratory problems, because of that basket weave we could not guarantee all the smoke or soot had been completely removed. We cleaned the bed set, we placed it in our ozone room to remove all odor, we cleaned it again. And the truth is, as many times as we could clean that with the smallest of surface areas, we could not guarantee that that set was going to be clean enough for her health. Smoke produces an odor that like its residue, is not the easiest to remove. Odors take some time to remove and proper precautions need to be taken. All our techs have experience in removing smoke, odor and smoke residue. A homeowner can attempt this on their own but will not always end with the desired conclusion. Sometimes they can get lucky, but it truly is best to let the professionals take care of your smoke, or odor damage. The Removal process can be anywhere from a small to extensive process. Ranging from cleaning and taking contents to our shop for the ozone room. The next step would be to be sealing and painting the effected rooms. And the most extreme case is to dispose of the items, this would-be worst-case scenario and best for you and your family’s health. Just remember as trained and certified professionals, there isn’t much we haven’t seen. Let us provide you with excellent service with great communication, customer friendly technicians and office staff, and a quick and speedy response and turn around. SERVPRO Gig Harbor/North Tacoma strives to make every experience one that is pleasant. Nobody wants to have their lives turned upside down, and nobody wants their lives turned around for an extended amount of time. If something isn’t right, we have amazing accountability. We want to make it right and WILL. The Betcher Family- Owners and operators. Why SERVPRO? Our SERVPRO of Gig Harbor/North Tacoma franchise is locally owned and operated since 1979. We are the second owner of this franchise and a second generation ran company. Our family relocated from Southern California back in 2005 to begin our SERVPRO adventure. Since then, our current owner went from field work to management, and now ownership. Matt is a respected owner who cares about every employee that works for him. He invests in the SERVPRO brand, the employees who represent it and the work we provide to local homeowners and business owners like you. We take pride in having our certifications and trainings updated. Our employees come to you with the best knowledge and training in our field. Not only are we experienced in all areas, we provide excellent customer service and attention to details. Our office staff is knowledgeable when it comes to your damage and we do our very best when it comes to making it “Like it never even happened.” The last thing you want is to call an office and have someone answer the phone who sounds like they don’t care about your loss or damage. As an owner and a homeowner, we have been on the flip side too, we have experienced water damage to our home and belongings. We know it’s not fun and we also understand the stress it causes to have your home turned upside down in these types of situations. In the scenario where the job may need more hands-on deck, here at SERVPRO of Gig Harbor/North Tacoma we can call on other close SERVPRO relationships. We believe it’s better to provide an overall spectrum of work with the same ethics and training than turn down a job. Our other local owners are all team players ready and willing to jump in and provide further assistance when it’s needed. We may be individually owned and operated but we all wear and represent the same brand- SERVPRO. Consistency and quality are crucial. Our owners are active in the community. We support our local Gig Harbor Chamber, Relay for Life of Gig Harbor, donations to our local school auctions, Swing for a Soldier sponsor, and other community events. It’s important to Matt staying active in the community, it’s also important to provide the best quality service when living in the same community we work within. There is the occasional conflict with customers in our service, at that point our managers, employees and owner go above and beyond to make sure customers are happy with the finished product. Our tag line is “Like it never even happened” and we truly strive to accomplish this. What to do when your Gig Harbor/North Tacoma home’s pipes freeze? Locally owned and operated SERVPRO of Gig Harbor/North Tacoma takes pride in helping our local community in their time of need. When your Gig Harbor home’s pipes freeze you can count on SERVPRO of Gig Harbor/North Tacoma. We have 15 years of experience helping Gig Harbor and surrounding areas, homeowners after their pipes have frozen, thawed and then flooded their home. SERVPRO of Gig Harbor/North Tacoma will make it "Like it never even happened." As we come into colder winter temperatures, we are all at risk of our pipes freezing and that can lead to pipes bursting. We have suggestions if you find that your pipes may be frozen, and list of suggestions on preventing pipes from freezing. One of the first signs that you have a problem, and even possibly a frozen pipe, is no running water coming out of your faucets when you attempt to turn it on. If this does happen check to see that your home’s water supply is still turned on, and that there are no obvious leaks anywhere. If your search concludes that your pipes are more than likely frozen, but not yet burst, we recommend calling your local plumber to help thaw your pipes. This is a good path for those who are unsure if they can safely thaw pipes themselves or if you are unaware of where the frozen pipes are located/can’t access the area of the house where the pipes are frozen. Make sure all pipes that are exposed to the extreme temperatures are drained. This includes but not limited to swimming pool and exterior sprinkler system supply lines. Disconnect any hoses from the exterior or your house. Drain the hoses and store them in the garage. Make sure that you keep your garage door closed at all times. Insulate the area around light fixtures, vents, and exterior faucets. This helps prevent freezing temperatures from gaining access to your home. Open cabinet doors that have plumbing running in them. This helps the warm air to circulate around the pipes, keeping them warm. Allow your faucets to drip cold water on the coldest days. The movement will make it harder for the water to freeze inside the pipes. In your house never let your thermostat fall below 55 degrees Fahrenheit. Night and day make sure that your home’s temperature never dips below freezing. This is one of the leading causes of frozen pipes, people do not want to pay for heating their homes when they are not it their homes. BUT – turning your heater off could lead to a risky game of frozen pipe roulette. Check all exterior seals on windows, doors, garage doors, etc. and complete any necessary repairs to make sure no heat is escaping your house. 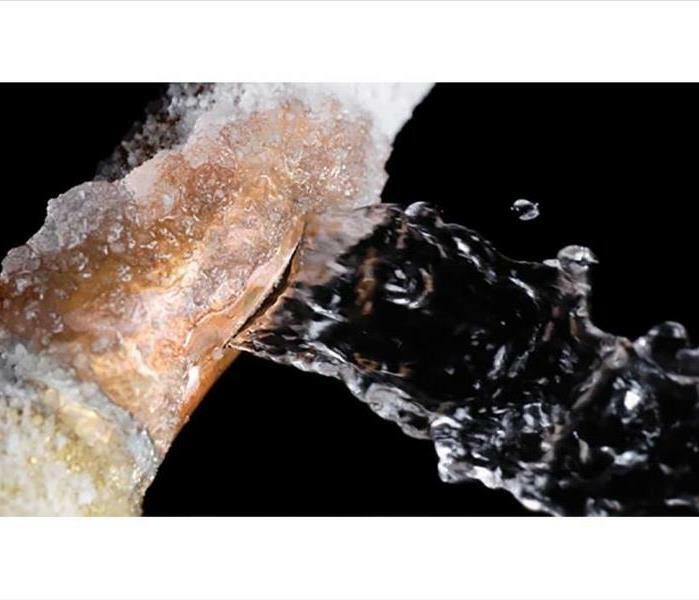 Frozen water pipes and the damage they can cause are a serious risk for people in areas that the temperatures dip below freezing, especially for an extended time period. When SERVPRO of Gig Harbor/North Tacoma responds to these types of claims we come prepared to help mitigate the damage and get your home back up and running as soon as possible. Because SERVPRO of Gig Harbor/North Tacoma is a local company we understand your concerns. because at the end of the day they are our concerns too. Give us a call with any questions or concerns you have about frozen pipes in your home or business 253-851-6711. Marketing Rep. Nicole and a rep from Sound Credit Union. Sound Credit Union donated around 90-100 bags in their 12 days of giving champagne. Are you still recovering from the hustle and bustle of the holiday season? In December, here at SERVPRO we committed to helping a local organization. 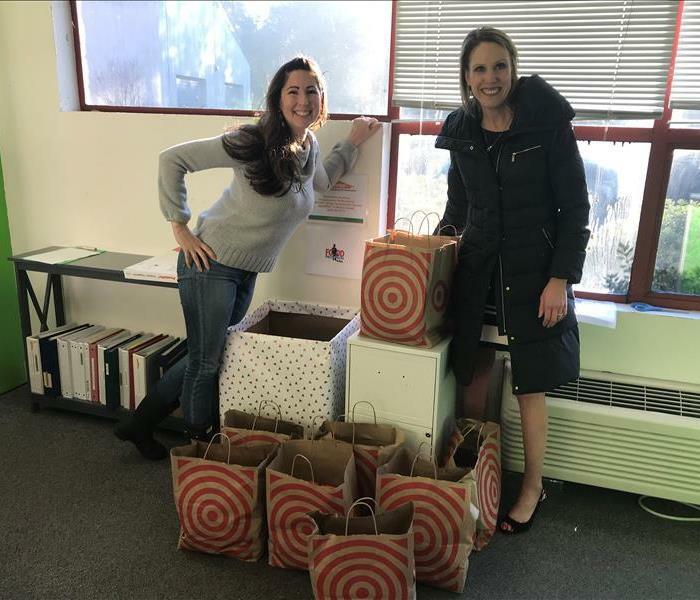 Our office contacted the wonderful ladies at our local Food for Backpacks group and asked how we could help give back this 2018 holiday season. Food for Backpacks is a local organization that is able to put together backpacks for kids who may not have the resources for regular meals. After speaking more and more with the organizers of F4B, our eyes were opened to the fact that there is a large percentage of kids who go to school to be provided with daily hot meals within our very community. When the holidays come into view, these kids who receive daily meals would now have to figure out daily meals at home for the holiday breaks to come. How scary! When speaking with Food for Backpacks, we were met with enthusiastic feedback and asked to collect 400 cookie and brownie mixes. 400 seemed like a large number, in fact we were worried we wouldn't be able to collect that from people. Our marketing department posted on social media platforms, such as: Facebook, Instagram and Linked in. We made flyers and sent them out to our local contacts and business, we let our weekly networking groups know of our goal and deadline. One of our employees even posted on their neighborhood Facebook page to ask their neighbors if they were interested in helping. It's so amazing how the holiday season brings a community together to support those who don't have much of anything. Word spread and before you know it our office was seeing local neighbors, business owners, people who had heard from the grapevine bringing in bags and boxes. Out of state relatives got onto Amazon and had deliveries made to the office. Here at SERVPRO we were overwhelmed by the generosity of others, who have a large heart to give back to these very deserving kids. No one should have to worry about their next meal, especially a child. We can't wait to be involved in something like this again and look forward to the next opportunity to give back to the community. Thank you to those who donated and a BIG thank you to the amazing volunteers and organizers at Food for Backpacks. When you are considering hiring a new company to come into the confides of your home it can be very stressful. You are trusting people in your space, with your family, to fix your home you have worked very hard to buy. This Blog will explain what makes our SERVPRO, SERVPRO of Gig Harbor/N. Tacoma the company you should trust with your most valuable possession, your home. As a SERVPRO employee I can be very honest about my review of SERVPRO of Gig Harbor/N. Tacoma. Since day one of working for the Betcher family I have felt at home. Although the environment can be very stressful in a mitigation office, the Betchers always care enough to ask how my day is going. Along with the support that they give my family all year round, the Betchers always come together during the summer and host a summer BBQ for their employees, and at the end of the year with an amazing Christmas Party for their employees and their spouses. The Betchers believe in promoting in house, and there are always incentives to be given to those who deserve it. Our SERVPRO treats each client more like family than just another paycheck. We understand that the damage to your home is more than a job site, but it is your home. This is where your kids grew up, or maybe its where you held your first Halloween party, either way this is your home and we will treat it with the care it deserves. We are constantly evolving and changing our methods to make our work for efficient and less intrusive to your home. SERVPRO of Gig Harbor/N. Tacoma takes pride in the training and certifications that we receive. We send all of our Water Restoration Technicians to get certified by the IICRC. The IICRC sets the standards for the restoration, mitigation, and cleaning industry. Come on into our office and you will be warmly welcomed by our front desk, and on the wall to the left you can see a plethora of awards, and certifications we display with pride. Another thing that SERVPRO of Gig Harbor/N. Tacoma takes great pride in is our community involvement. We continue to grow in our community every year. We have been avid supporters of our local community events; Relay for Life, Swing for a Soldier, Maritime Festival, etc. Being a part of a great team like SERVPRO of Gig Harbor/N. Tacoma has given me a sense of pride that I have never felt before. We are constantly promoting change to help us become a better company. Have a question about something negative you may have heard? Give us a call, and we will put you in touch with the project manager and they can explain how we handled the issue in a timely manner. Although we wish we were perfect, we realize that mistakes can be made, the difference with SERVPRO of Gig Harbor/N. Tacoma is that we will address the issue and figure out what we need to do to make things right. You can reach me at 253-851-6711 and ask for Stephany. Here at SERVPRO of Gig Harbor/N. Tacoma we love our growing community. There is no place the Pacific Northwest during the fall. I can't begin to describe the beauty of all the colors. Deep crimson, apple red, rusty orange, pumpkin orange, and marigold yellow. My personal favorite are the maples that do a spectrum of colors as the season changes. Although we would absolutely love partaking in all the different season events we can’t be everywhere at once, so we thought we could fill you in on some of our favorite upcoming Fall events in Gig Harbor. Cider Swig – The Cider Swig is schedule for September 29th between 12:00PM and 5:00PM. This event is located at one of our favorite local parks, Sehmel Homestead Park. Approximately two dozen different regional cidermakers will be present, and there will be upwards of ninety different hard ciders to sample! Along with the fantastic cider there will be live entertainment! Yum. NW Glass Pumpkin Patch – The NW Glass Pumpkin Patch is taking place on September 29th from 9:00AM to 3:00PM. There will be a new location this year, the patch will be held at the Peninsula Market (Old Peninsula Gardens). Admission is free, and it is such an amazing site to see! Wander through a spectacular array of one of a kinds of glass pumpkins in every shape, size, and color imaginable! Each of the glass pumpkins is hand blown by local glass artisans. Scarecrow Festival – The Scarecrow Festival is scheduled for October 6th between 10:00AM and 4:00PM. Once again, this event is located at Sehmel Homestead Park, and would be a great time for the entire family! This is an autumn celebration with all sorts of different decorated scarecrows, live entertainment, farm animals, hay rides, camel and pony rides, a hay maze, and fun food and fair treat vendors! Trick or Treat in the Harbor – Trick or Treat in the Harbor will take place on Halloween October 31st, from 3:00PM to 6:00PM. There will be so much going on all at once… The Harbor Dance will be performing a “Spooktacular Surprise” at 4:30PM and 5:00PM in front of Skansie Brothers Park. The Harbor Wildwatch are presenting the Mad Scientist Laboratory at the Skansie Brothers House. Trunk or Treat will be at the Church of the Nazarene with fun carnival games and an inflatable bounce house! The also provide hot coco or spiced cider for a small price. Don’t forget to bring the kids to visit Paradise Theatre’s Haunted house from 4:00PM to 6:00PM. Rain or shine all the above events are going to be a blast! We here at SERVPRO LOVE the fall and can’t wait to see you at all these wonderful events! SERVPRO is your locally owned and operated fire restoration, water mitigation, flood water extraction, mold remediation, biohazardous cleaning, carpet cleaning, content manipulation and content cleaning company. We hope that in the case that you are in need of any of those services you’ll call upon your local Gig Harbor specialists! With pumpkin spice in our coffees, and the leaves starting to change and fall there is no better place to live. We take pride in our community and want our community to take pride in our company. Please let us know if you have any questions or concerns! We moved from a “fixer upper” into a new development home back in 2016. We had lived in our sweet home for about ten years and needed a little more space. Two kids later we discovered how quickly you can outgrow a space. We fell in love with a model home in a new development in our city. We couldn’t wait to move in. A brand-new home, this was a first for us and we were eagerly anticipating a smaller yard with less up keep, and “new” everything that wouldn’t need a ton of consistent attention. The first two weeks were bliss, until our first bubble bath in our master bathroom. Heating the water was a little different from our last home and it took a little getting used to. So much so, that we filled the tub and added more hot water to the tub, relying on the drain to release the excess water. While this is happening, I noticed my husband was yelling- not his typical trait. I left the bathroom to hear better what the commotion was about, and as it turned out the kitchen ceiling was raining! He was yelling to tell me to stop filling the tub. I was confused, how was the water coming from our bathroom tub to the kitchen? As it turns out, when the tub was installed they forgot to caulk the drain. It was somehow overlooked, and it caused this large water loss in the first two weeks of being in our brand-new home. Our kitchen floor had buckled rapidly, the water effected the base boards and drywall all within an hour or so. Thankfully under our year warrantee it was fixed but that too came with its ups and downs. As a business owner of a water restoration company and a homeowner with a water damage, it was not a smooth sailing process to get our kitchen back to new. Keep in mind this all happened as we were expecting to have a holiday company party within the month. The holidays were in full swing and we all know that added confusion that can add to daily life in general. The replacement floor was replaced by someone who is color blind and installed the wrong color flooring. The dry wall was uneven and didn’t get painted until much, much later. It was a nightmare. 4/1/2019 - Why SERVPRO? Why not? 3/19/2019 - Commercial loss with a speedy response. 8/7/2018 - Raining indoors, a water damage.